As much as we’ve come to like most of the Volkswagen I.D. electric car concepts so far, it was inevitable that the money-making crossovers would show up and spoil some of the fun. Introducing the Volkswagen I.D. Roomzz, an electric crossover concept named like a dad joke. From the modular electric vehicle architecture that brought you such hit concepts as the I.D. hatchback, I.D. Buzz van, I.D. Vizzion sedan, and I.D. Buggy, comes an electric full-size crossover concept called the I.D. Roomzz. If you’re wondering why it’s called the Roomzz, which my colleague Tom pointed out sounds like a bad Snoop Dogg impression, it’s because of all of the room inside, which should be boosted by the unique packaging of Volkswagen’s MEB electric vehicle platform. They couldn’t call it something a little less cringeworthy, like the I.D. Crozz, because that’s already another, smaller VW concept crossover. We’ll have to wait and see if the system ends up being that capable initially, and whether or not it will actually be allowed for use on Chinese or American roads. 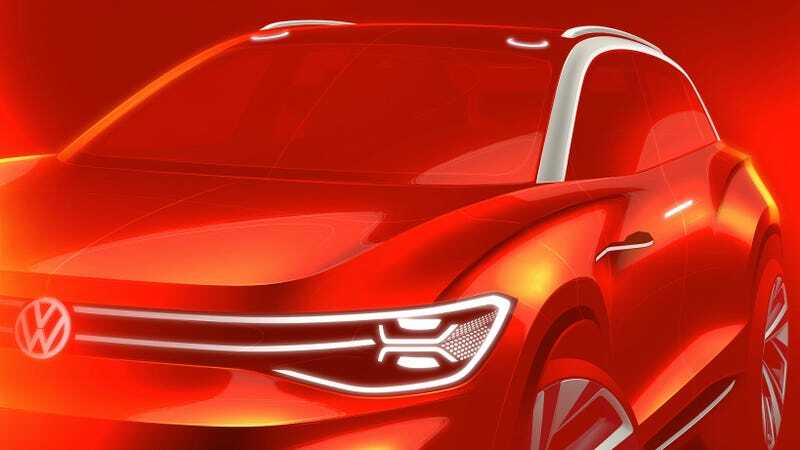 The Roomzz will be officially revealed at the Shanghai Auto Show the week of April 16th. I’m mostly just curious if there will be roomzz for all of these new electric vehicles in the market by 2021. I said it and I’m not sorry.